Their key riders earned strong qualifying points in the World Cup meets in Mexico and London late last year to allow Cycling New Zealand the opportunity to blood a number of development riders and coaches in Cali. Head coach Dayle Cheatley said the experience will be invaluable looking ahead to the Rio Olympics and beyond. “We are excited about this opportunity and it represents a chance for both riders and coaches to see what competition at this level is all about,” Cheatley said. “Some countries that still needing points have come here with their best teams, some like the French are very strong and so it will be a tough competition. Tomorrow begins with qualifying for the team pursuit, with the men’s team comprising three members of last year’s junior world championship team of Nick Kergozou, Luke Mudgway and Regan Gough, along with Myron Simpson in the men, while the women’s combination includes all newcomers in Holly Edmondston, Pip Sutton and 17 year old Bryony Botha. It is expected that Waikato’s Racquel Sheath, the team’s omnium rider this season, may also take part in the qualifying ride tomorrow in the 3000m team pursuit. The team sprinters also chase qualification tomorrow with Katie Schofield paired with London Olympian Natasha Hansen, who makes her return to international competition in the women’s team sprint, while teenager Lewis Eccles starts with Zac Williams and Olympic medallist Simon van Velthooven, who competes for the first time since the Commonwealth Games. Sheath and Southland’s Cameron Karwowski will compete in the omnium, with van Velthooven and Schofield riding in the sprint and keirin and Williams in the sprint. The riders have got accustomed to the environment in Cali, with temperatures in the mid 30C Deg and high humidity, along with the challenge of some altitude, resting at over 1000m. They also have to contend with the winds in the velodrome which has open sides because of the temperatures. “We had good experience with this at the world championships and world cups in the past so have prepared accordingly,” said Cheatley. The World Cup runs until Monday before the riders return home to ready for the Skoda national championships at the Avantidrome in Cambridge on 29 January to 1 February, which forms the final trial for February’s world championship in Paris. 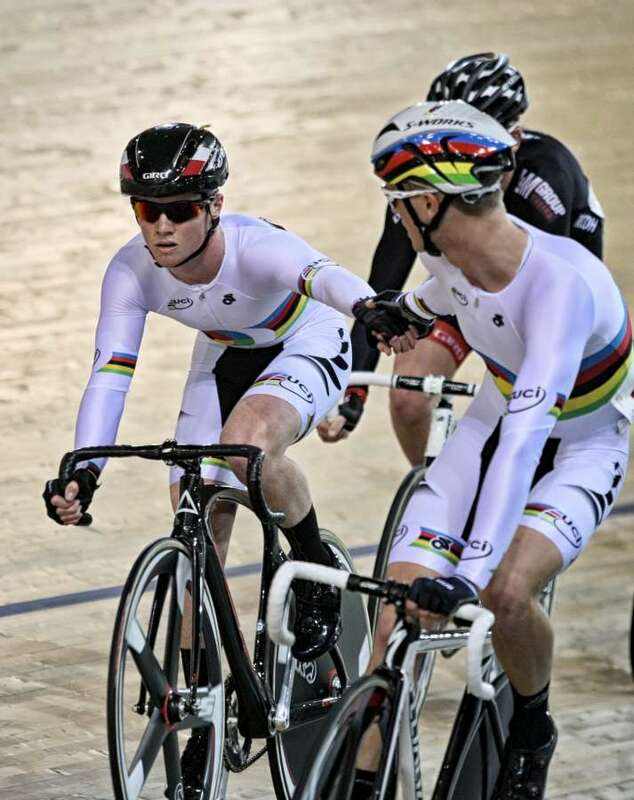 CAPTION: Junior world Madison champions Regan Gough and Luke Mudgway make their elite World Cup debut in Cali.